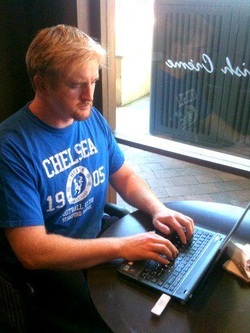 Brian M hard at work at his local coffee shop. But, even there, the mighty blues are never far from his thoughts! Brian M Logan is an Acting graduate of Australia's prestigious ACARTS (ne. CPA) college, where he was taught by such luminaries as John Noble, William Zappa and Oscar winner Geoffrey Rush. He is an Advertising Copywriting graduate (AWARD and MASTERCLASS), a Marketing Graduate (Gillies Plains) and has extensive professional experience within the film, TV, Multi-media and Events industries. A lifelong Chelsea fan (literally, he cannot remember a time before he followed the Blues) and native of Wales (UK), Brian M currently resides in Sydney, Australia. Brian M has acted in six feature films (co-starring in 3) and has worked with such notables as: Martin Campbell, Ray Liotta, Elliot Gould, Lance Hendrickson, Kevin Dillan, Trevor Farrant, Baz Luhrmann, Garry McDonald, Julian McMahon and Gale Ann Hurd. He is also 2 Degrees of Kevin Bacon. Twice. Brian M is a Nicholl Fellowship screenwriting finalist (top 10 out of 6048) and was the first ever finalist to come from outside the USA or Canada in the history of the competition. Note: the Nicholl Fellowship in Screenwriting is the world's largest screenplay contest for writers looking to break into Hollywood, and is run by the Academy of Motion Pictures Arts and Sciences. Brian M's first books, 'Monster Town' and 'The Butcher of Box Hill' (released in the US in March 2010 by Bad Moon Books) was picked up by Sony TV in Hollywood in November 2011 with the producer of Clash of the Titans attached, and the writer / producer of 24 / Dexter / The Shield attached as show runner. The book is being developed as a major new US TV series, and is being dubbed: 'The new True Blood'. Brian M produced Australia's first ever streaming film and music website (the now defunct, IndieFilmWeb.com) in August 2000. A site which was perhaps best described as 'The YouTube before YouTube'. At its peak, IndieFilmWeb.com was the 14th most popular Australian website in the much contested 'Entertainment' section, as listed on Hitwise. Brian M also has extensive production experience in the events' industry. Highlights include: producing Digital Media World and the Effects & Animation Film Festival. Producing the official AMPTA (Australian Mobile Telecommunication Authority) Congress. And producing Australia's largest 'Broadcast' expo (Australia's answer to NAB). Notable firsts include, digital television being officially launched at one of Brian M's shows by the then Australian Federal Minister for Technology & the Arts, Senator Alston. And the first ever live streaming of an expo being initiated by Brian M at one of his shows. Brian M has ten years experience as a Search Engine Optimization (SEO) specialist, and, when he's not being consumed by his latest novel or screenplay, he spends his free time running a successful SEO company in Sydney's North Shore, where he delights in getting people / companies on the first page of Google searches.